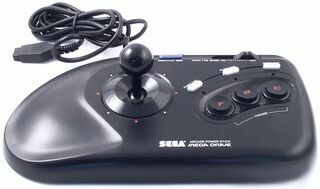 The Arcade Power Stick (アーケードパワースティック) is an arcade stick peripheral for the Sega Mega Drive (though is also compatible with other consoles/computer that rely on DE-9 ports). The Arcade Power Stick has three face buttons equipped with turbo features, which whose speed can be configured. A version by S-Chi was also released. The Japanese release of the Arcade Power Stick features a joystick with microswitches, akin to arcade hardware. All non-Japanese versions of the peripheral utilize joysticks with rubber contacts, similar to the D-pad of a standard controller. All releases regardless of region use face buttons with rubber contacts, identical in function to that of a standard controller. The Arcade Power Stick was followed by the Arcade Power Stick 6B. Main article: Arcade Power Stick/Magazine articles.